Do you feel 100% comfortable in the content involved with teaching fractions? How can we as teachers create meaning with motivation on this difficult area of mathematics? In this all-day workshop, Kim Sutton will share important strategies to build a strong geometric foundation for fractions for first and second grade teachers as well as tips for third, fourth and fifth grade teachers to use manipulative models to further classroom understanding of area, set and number lines in a clear and fun way. Building a strong understanding of fractions starts early in primary grades with geometry standards in first and second grade by partitioning shapes using fractions. Developing number sense concepts like subitizing, composing and decomposing of numbers, and simple division build understandings of part-to-whole relationships, a key building block of fractions for early learners. Third through fifth grade students deal with multiple models of fractions, and the manipulation of fractions with the four operations. Participants will explore strategies for classroom motivation with games, songs, dances and literature in this exciting new class for grades 1-5. Kim will give practical strategies with “hands on” activities that push children to understand the conceptual meaning of fractions. Geometry and number sense standards will be included in all the activities. She will use a variety of tools for everyday use to help students get comfortable applying fractions to areas like data analysis and geometry. Kim will share fun questioning strategies with fractions that help with evaluation and student understanding. Teachers will be amazed at how their own content knowledge increases as Kim shares ideas for students! The manual will become a meaningful number sense guide, and teachers will leave the workshop with many models they build in class. Come prepared to adjust your attitude about teaching fractions! Key geometry concepts and activities to build basic understanding of fractions for students starting in first grade. How to effectively use constructed fraction tools for maximum classroom success. Strategies for using manipulatives to teach addition, subtraction, multiplication and division. How everyday practice tools, like using a fraction meaning statement to define the three models of understandings for fractions, positively affect standardized testing results. Quick shortcuts to deepen student understanding of algorithms based on modeled manipulatives. Helpful hints to create simple three to five minute practice points that you can use multiple times a week to build a strong foundation for fractions. Tips to encourage classroom discussion and data analysis using fractions. Construct fun new tools for increased part-to-whole understanding that you and your students will love! Designing simple tools for set and number line models of fractions will give needed picture models of fractions to help your classroom transition to dealing with more abstract terms and algorithms. 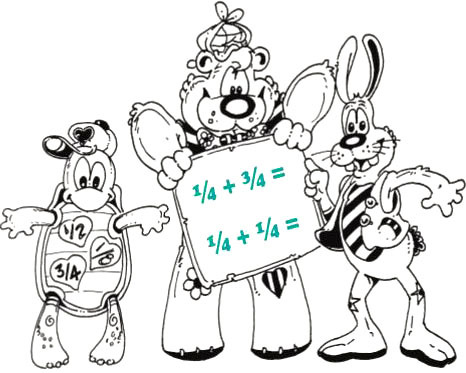 Fun games that practice all three models of fractions by grade level will help connect prior knowledge of number sense to fractions. Strategies for using the meaning statements for the operations to teach addition, subtraction, multiplication and division of fractions. This section will become your favorite! Watch your own understanding become crystal clear! Learn to apply fractions to data analysis. Kim will introduce three amazing graphs that encourage “Math Talk” with fractions. Deeper understanding of teaching fractions for your grade level than you’ll find in a textbook. Kim Sutton is a fabulous presenter, who has taught thousands of teachers the joy and excitement of hands-on math. Kim’s teaching experience includes over 25 years of classroom teaching, time as a regional math specialist and as a university instructor. Kim has worked with over 150 districts nationally and internationally as a staff development consultant. Kim has a Master’s degree in Mathematics Education and has been the keynote speaker for state and regional math conferences. Kim has produced many wonderful math games and tools and is the author of 16 titles, as well as the creator of the 10 Block Schedule for Math Fact Fluency program for grades K-6. Experience what others have learned—Kim Sutton is a dynamic, extraordinary educator whose enthusiasm and love for teaching are contagious! She gives you practical, easy to implement information and ideas that you will use for years. Don’t miss this wonderful opportunity to be thrilled, challenged, and energized! All 1-5 Classroom Teachers, Resource Specialists, Curriculum Coordinators and Administrators should attend. Scissors, marking pens, scotch tape, stapler, hole punch and camera (optional).